Just as John Henry Clayton thought he was out, they pull him back in. Directed by Jon Cassar, Forsaken is a humdrum Western which never demonstrates even the suggestion of a trick up its sleeve. 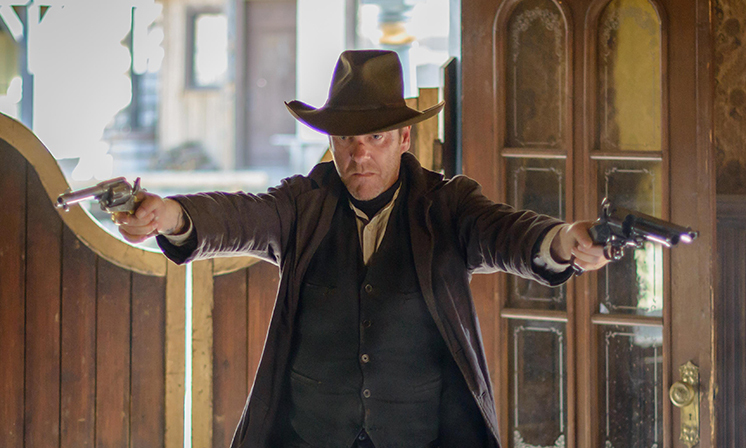 Kiefer Sutherland tops the bill as a reformed gunslinger, a prodigal son returning home from the Civil War to a town under the leather boot of no good rootin’ tootin’ bad guys. With a desire to put a life of killing behind him, live off the land, rekindle an old flame and reconcile with his preacher father – played by Sutherland Sr., Donald – John Henry is running away from a chequered past. In a similar vein to Clint Eastwood’s grizzled, weary Bill Munny in Unforgiven, here we have a figure scarred internally and externally, haunted by former sins but, in spite of the film’s title, harbouring a will for redemption from the big man upstairs. Sadly, Forsaken has none of the brutally gripping, nuanced brilliance of its distant cinematic cousin and is altogether too predictable to linger in the mind. Maltese-Canadian filmmaker Cassar, who previously directed Sutherland in the 24 series, zeroes in on the actor’s twitchy stare in an early close-up and opening exchanges between onscreen father and son are frosty to say the least: “Your mother is dead,” says an embittered Reverend Clayton, blaming his offspring for her passing. Stubborn stoicism evidently a family trait, the two men orbit one another awkwardly as John Henry sets about clearing a field as penance in his ma’s name. Meanwhile the aforementioned band of merciless men, led by Brian Cox’s greedy landowner, take names and properties left, right and centre. The cowering townspeople cry out for a hero: “We need a man who knows trouble,” they say. No guesses for who they call. Lighting from candles and oil lamps drapes rooms in a suitably dank light but a green lens used throughout gives all characters the appearance of scurvy, and largely tan or brown costume doesn’t do much to brighten the murk. Though set in a nondescript USA frontier town, Alberta’s savage beauty is framed admirably by cinematographer Rene Ohashi. However the beauty of exteriors and oppression of interiors is oddly jarring. As is so often the case with generic Westerns, the world inhabited by the Claytons and their foes is a man’s one, women relegated to the home or brothel. Demi Moore features as Mary-Alice, an old squeeze of John Henry’s now married and mother to a young son. She has little more to her than foil for jealousy subplot and scenes of long-lost yearning don’t do much to pull on the heartstrings. Brad Mirman’s script is nothing to write home about, hitting a number of thunderous low points – “Is there a place for us to go, to get away from the killing?” – and it comes as no surprise at all when John Henry is inexorably drawn into the fray. The transition of wounded prey to vicious lion doesn’t quite work and when the dust settles it’s a relief for all involved that guns can well and truly be holstered.